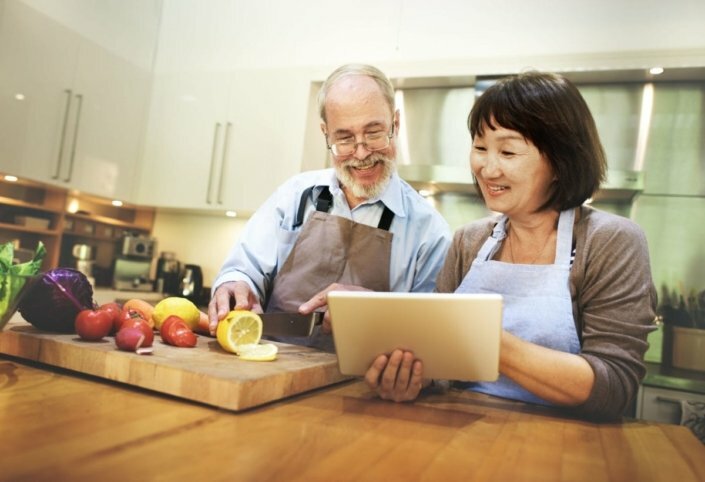 Food safety is another concern for men and women over the age of 50. As we age, our bodies are less able to fight off infections that come from unsafe food. Wash raw foods with soap. Keep your hands, cutting tools, and surface areas clean with hot soapy water when preparing food. Cook your food to the required temperature. And always refrigerate foods within 2 hours of cooking. Most importantly, men and women over the age of 50 need plenty of water. Doctors recommend drinking water throughout the day to prevent dehydration. Dehydration can lead to dizziness, falls, low blood pressure, poor kidney function, and other conditions. Drinking enough water helps your kidneys flush the toxins from your body. Even if you are not thirsty, it’s important to have water throughout the day. Plain water is best. However, you can get water from soup broths and limited amounts of coffee and tea. Too much caffeine strips your body of water. Try adding water to your routine by drinking a glass before each meal and snack. Sip it during meals and snacks, too. Be sure to drink plenty of water before exercising or being out in the sun. If I naturally have low blood pressure, do I have to watch my daily sodium? Can I take vitamins to supplement what I’m not getting from food? How do I replace dairy if I am lactose intolerant? How many daily calories should a man and a woman have if they are trying to lose weight?